Research on police integrity has focused to a large extent on the assessment of the seriousness of various forms of police misconduct. Employing vignettes cases it has been shown that police officers identify clear differences among forms of misconduct and these differences largely hold across countries and contexts. Moreover, the impact of a range of individual and organizational characteristics on the assessment of misbehavior has been established. 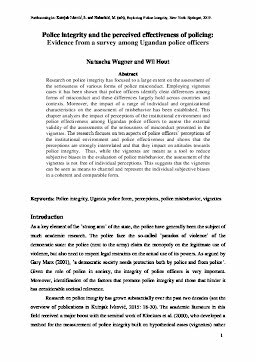 This chapter analyzes the impact of perceptions of the institutional environment and police effectiveness among Ugandan police officers to assess the external validity of the assessments of the seriousness of misconduct presented in the vignettes. The research focuses on ten aspects of police officers’ perceptions of the institutional environment and police effectiveness and shows that the perceptions are strongly interrelated and that they impact on attitudes towards police integrity. Thus, while the vignettes are meant as a tool to reduce subjective biases in the evaluation of police misbehavior, the assessment of the vignettes is not free of individual perceptions. This suggests that the vignettes can be seen as means to channel and represent the individual subjective biases in a coherent and comparable form.